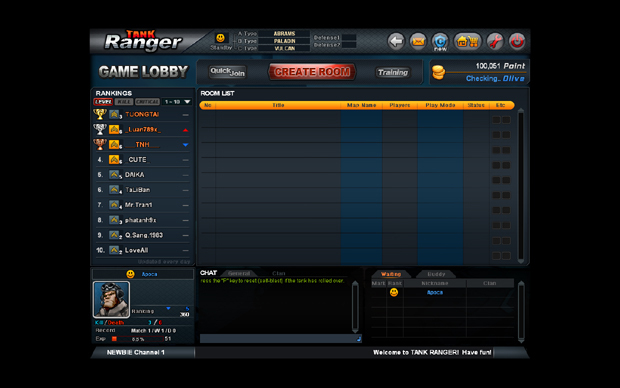 Tank Ranger is a new tank-themed lobby-based game, hoping to ride on the success of World of Tanks. It is brought to us by Olive Games, and this is the first title I have seen from them. 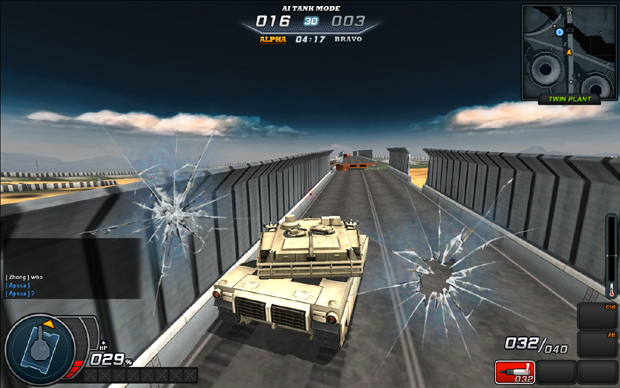 The premise of the game is simple enough – you join a game, choose a tank, and then blast away at your enemies. The game seems to be much more casual than World of Tanks, and is your typical lobby-based shooter experience. But with tanks. YAY. To be honest, customization seems heavily restricted. The most prominent form it appears in is skins and paint for the tanks. You can get a red camo tank, or something like pitch black. Other than that, there really isn’t anything else to do in terms of customization. A few years ago I would not have blinked an eye at this, but it has become an industry standard to push as much customization as possible on your players – even in a shooter-type game like this. I was a bit in awe when I first began to mess with the graphics settings in Tank Ranger. I wish I could say this was a good kind of awe, but it wasn’t. 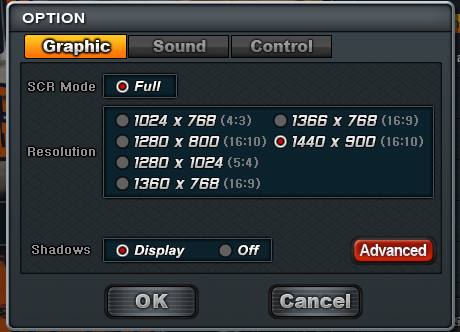 I literally gaped when I found out that the maximum resolution supported is 1400×900. At first I shrugged and hopefully thought that perhaps the game is meant to be played in window mode. It would explain the low resolution support. Once I found out that the game does not (currently) support the ability to play in windowed mode, I almost gave up on the spot. Because of the low resolution and the lack of windowed mode, Tank Ranger has some pretty bad graphics. Similar to what I would expect to find in a decade-old FPS. Normally I do not put too much weight in graphics quality when I play a game, but when I’m playing a game like this that only has simple “kill the enemy” type gameplay I cannot be as forgiving. However, I toughed it out and continued reviewing the game. 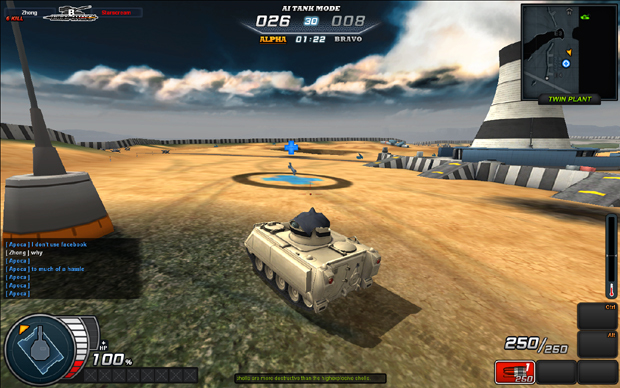 Controls in Tank Ranger are simple enough to learn. WASD movement, right click to zoom and left click to shoot. You can press shift to make use of the “drift” feature – which really isn’t a drift as far as I could tell, just a sharp turn. For the most part the controls were smooth and quite responsive. Overall I was pleased with how well the controls worked. This is the sad part of the review. In my time trying to review the game, I could only find one person playing the game besides myself. Even after logging on multiple times a day for several days. So far he has been my only contact with the community of Tank Ranger players. I am thinking, based on a few guesses, that a majority of the players may not be based in North America. So, the already small community probably wasn’t likely to be present during my waking hours. In short, the community is small – you could almost say it doesn’t exist. Take your average 2006-or-later FPS and then add in tanks instead of people. That is Tank Ranger. You join a lobby and then choose a game. 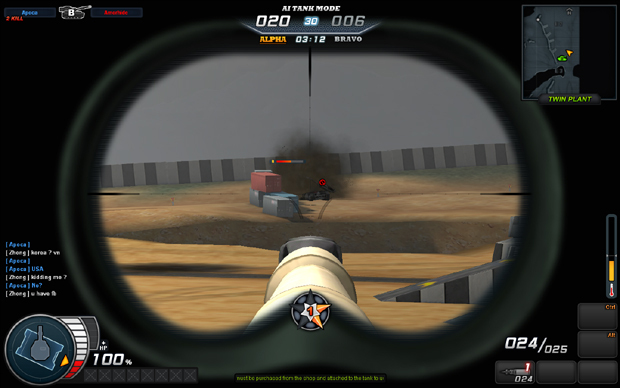 You will be put head-to-head against enemy players – or enemy AI if not enough enemy players are present. There really isn’t much diversity in the games tank selection yet. As far as I can see, you are stuck with five different tanks that each fill certain archetypes. There is a tank for up-close and mid-range fighting that has decent protection. Also available is a tank that is great for long-ranged fighting, but can quickly be dispatched if an enemy gets close to it. Then there is a very weak tank with a machine gun that is extremely fast compared to the other choices – more of an APC than a tank. As I said, right now there are only these three options available, but I imagine more will be coming out later on. The combat is very arcade-ish. More so than similar games such as World of Tanks. As far as I could tell through my time playing, there is no individual damaging of components such as treads or gas tanks. Essentially, you just have to hit an enemy three-to-four times anywhere on the tank and then it will explode. I’m not a very big fan of this, but I know there are people out there that will appreciate this. 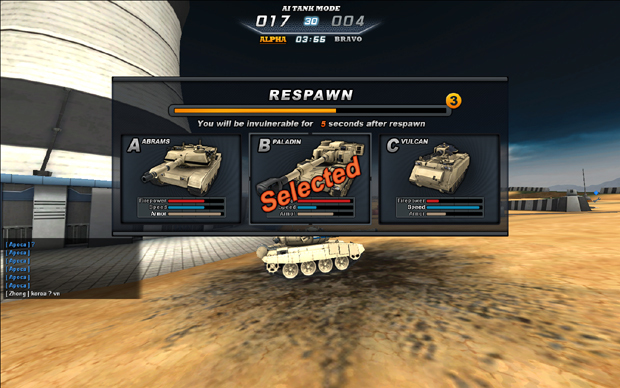 The game does offer tank upgrades, such as extra weapons or speed boost, which can add variety and uniqueness to your tactics. A lot of people worry about pay-to-win cash shops. From what I see, Tank Rangers has a pretty fair cash shop as almost everything available can be bought with the in-game currency you gain from playing, as well as the cash shop money. The only things I saw that could not be bought with game points were convenience items such as experience boost. I did notice that the cash shop does have a lot of seemingly over-powered upgrades that will require you to use the cash shop if you want to stay on top. There are five gamemodes covering the traditional modes you will find in most lobby-based games. Eight maps have been released so far to play these gamemodes on. The only gamemode I was actually able to find people playing is the AI-versus mode. And while they had good aim, the AI weren’t very bright and would just follow predictable paths. Using the fact that hiding behind a building very quickly will stop all damage from hitting you, camping the AI is an easy way to advance. I really wish there were more people playing this game as it would have been a lot more fun. 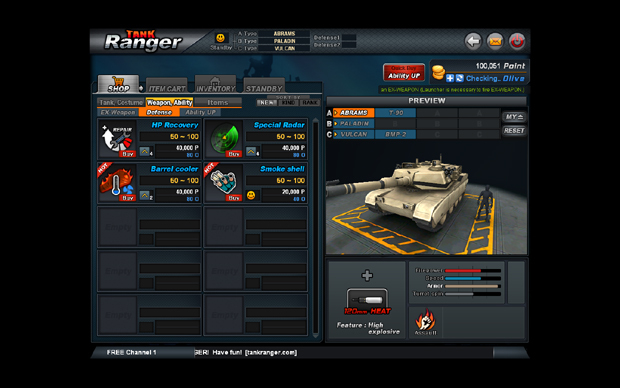 In short, Tank Ranger is an MMO with a tank theme which is quite shallow in the gameplay area. There is no depth to it. However, we shouldn’t mistake this as a negative thing right off the bat. I know there are people out there that will like that you can just log in, pick a tank, and then go head-to-head with other players. As long as the developers can add a bit more content and improve the graphics options, this should make for a decent gaming experience. For now, however, I was disappointed with what I saw. This entry was posted in Editorial, Game Reviews, MMO MMORPG News on July 31, 2013 by Darren Henderson. Late last year Aion held weapon design contests, and now that the contests are over, the designs have been made, they can finally be seen in game. There is one new skin for each class. The winners of the competition will receive the weapons for free while everyone else can get these weapons on the Black Cloud Marketplace. The end of the month means a letter of love from TSW Game Director Joel Bylos. This month Joel has announced that the development team is being split in two. One team to focus on updates for Issue 8, while the other works on Tokyo for Issue 9. Issue 8 will begin at the Council of Venice where players will be able to access the new Scenario system and earn certification to enter the Tokyo playfield coming in Issue 9. This entry was posted in Articles, MMO MMORPG News on July 31, 2013 by Shannon Doyle. This entry was posted in Articles, Editorial, MMO MMORPG News on July 31, 2013 by Jaime Skelton. 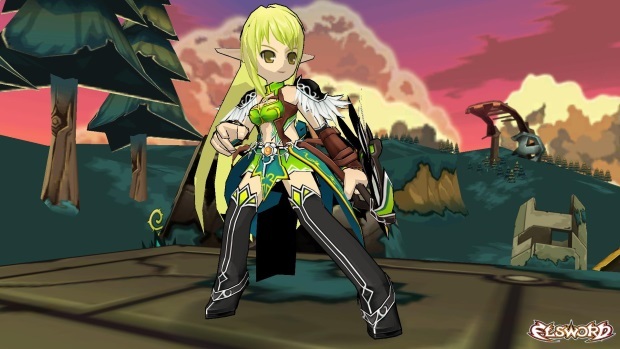 This entry was posted in MMO MMORPG Games List on July 30, 2013 by CPMStar. This entry was posted in Videos on July 30, 2013 by CPMStar. OnRPG is teaming up with one of the hottest browser mafia titles on the market, Mobsly, to get you some cash shop currency to begin building your underground crime ring! 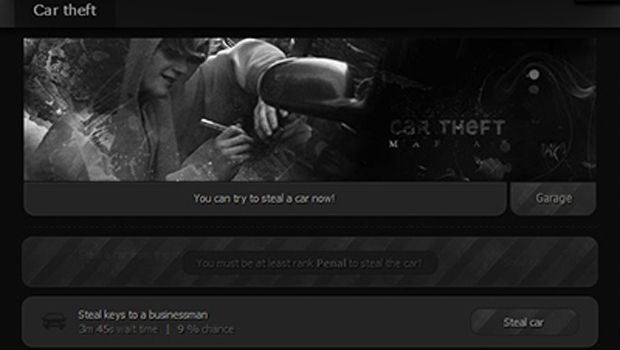 Mobsly is free to play browser based mafia rpg game. It offers the most fierce, dangerous and professional mafia world ever created. In the world of Mobsly, you can steal for money, steal cars, hire hookers to earn you money, buy a brothel for them, buy bullets, play lottery or other games to make more money, grow weed, kill other players, create a families, and so much more. 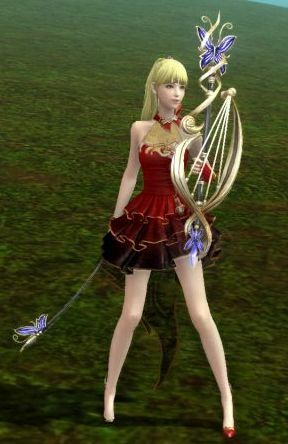 This entry was posted in MMO MMORPG Giveaways on July 30, 2013 by Darren Henderson. Today Arenanet announced the next phase in the biweekly living story updates. This one surrounds celebrating a decade of Queen Jennah’s rule. And if her looks are anything to go by that means she wasn’t even a teen when she took the job. Players will be able to ride hot air balloons, enter a new minizone battle arena, plus there will be quality of life updates for currencies, new weapons, and much more. Miss out on the last Open House The Mighty Quest for Epic Loot had? Well have no fear. You can log in now! That’s right, from today until August 6th anyone can give it a go. And for an extra added bonus, if players can kill no less than 10 million chickens in that time the chicken will be made a castle defence item in the next update. There will also be awesome giveaways on the official Facebook page. 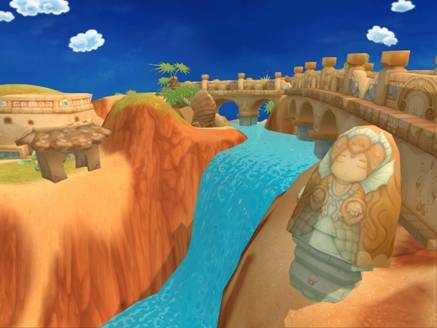 This entry was posted in Articles, MMO MMORPG News on July 30, 2013 by Shannon Doyle. 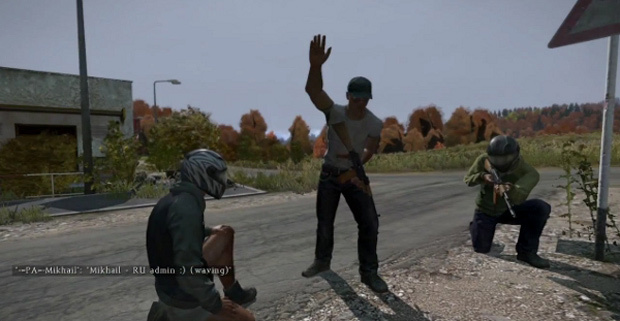 It has been around a year since the ArmA 2 mod DayZ exploded and showed the world what a basic mod with an inspired developer was able to do. It’s been a long year. While the modification is still being updated regularly by the community, and a lot of similar mods have risen up, the big question to the true fans is, where is the Standalone? 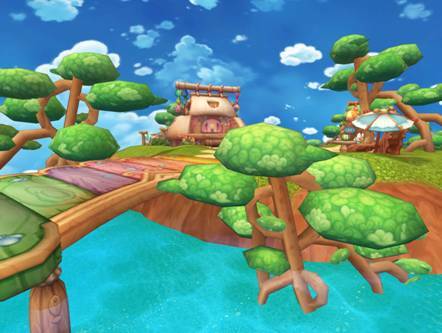 Originally the plan was to launch it in the end of 2012, but here we are in the summer of 2013 and we haven’t seen nor heard that much about the game. What do we know and what is different compared to the mod? As a big fan and close follower of DayZ and the team behind it, I can say with confidence that it has been a really long year for Dean ‘Rocket’ Hall, the lead developer behind the DayZ Standalone. Dean never expected this side project of his to explode so quickly. What started out as a hobby changed his whole life. 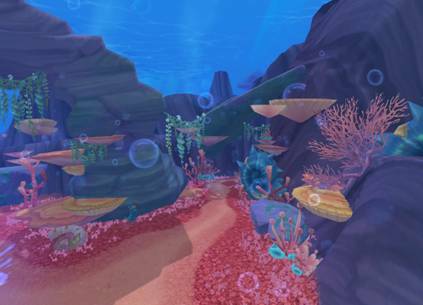 Since the original plan was to launch the game back in December, a lot of things were changed and most of the initial plans were scrapped or greatly reworked. Let’s start at what might be the biggest change in the whole game, the architecture. Initially the plan was to create a standalone game of the mod, with not many major changes to the engine or code itself. This plan was changed, and they decided to build up the game from the ground up. What big game studios do in years, they are doing it in just a few months. They have changed the architecture from being just a first-person-shooter to a fleshed out MMORPG. And the uninitiated might be wondering how that’s even possible on Bohemia Studios’ ArmA 3 engine. Well it isn’t. They’re tweaking it into a separate engine while splicing in elements of the Take on Helicopters game, and upgraded the graphical areas in the areas required to make a believable zombie survival title. 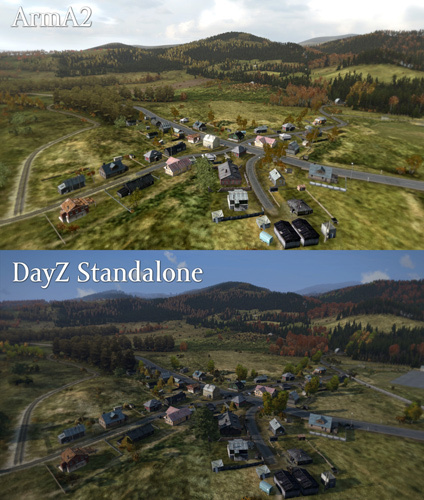 The world map also has undergone a lot of major changes, and the old Chernarus is a lot different than what the current DayZ players are familiar with. 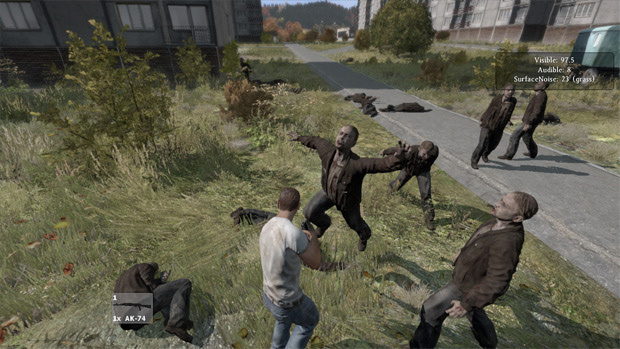 Rest assured the map itself is made by people that worked on the original Chernarus, so skillful hands will deliver our new village of zombies. From what I’ve seen so far, it feels like a much larger and more populated city. Chernarus now welcomes a real apocalypse world, where the visual images tell you the story, the events that might’ve happened, and what kind of people lived there. Beyond the township, a foreboding swamp also awaits adventurous players seeking to live outside the bounds of society. But that isn’t the only eye candy that we are able to expect from the standalone. A lot of the buildings were overhauled and nearly all have interior access. Expect plenty of looting and player versus player confrontations to occur in-doors as a result. The interior of buildings will also feel a bit more apocalyptic than the mod. Furniture will be overturned, rubble will block various routes from caved in buildings. And ammo and other loot will likely be hidden under beds or scattered across the ground rather than neatly placed on tables. Sure you might still find the occasionally goody in a cupboard or on a car seat, but that just adds to the uncertainty of your adventure. 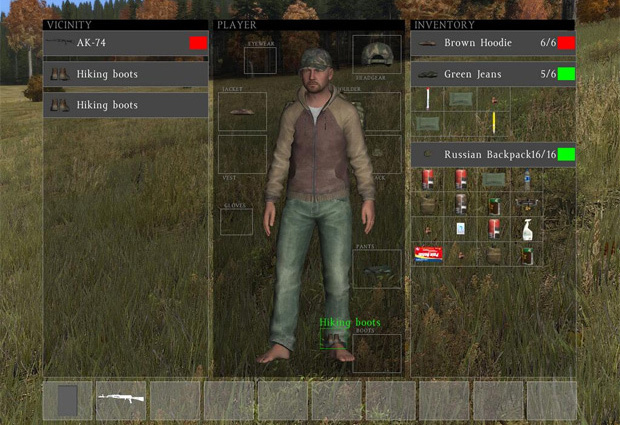 And thankfully the buggy inventory system of ArmA has also been changed into something that is more user friendly. Of course bandits aren’t the only enemy lurking behind locked doors in DayZ. The pathfinding of zombies have undergone some big changes as well. You will no longer see them zigzagging around trying to find a way to eat you, but this time these scary nasty things will walk finding the shortest route from A to B. Players will need to think on their feet to keep their cheekbone intact. The new engine allows more advanced algorithms in spawning mechanics to helpfully place flesh eaters in shadows and other unexpected ambush points to keep you guessing. Over the last few months, we have seen quite a lot of footage from the changed inventory system, loot spawning and zombies. The most notable change is a more advanced color spectrum. No longer will we be trapped in the greyish yellow warzone filter of ArmA. Unfortunately for Dean, the zombies aren’t the only ones getting hungry. Dean himself has had to face the wrath of a mob of fans and rabid media. I wanted to talk about this for a brief moment, being a follower of him on both twitter and reddit. See Dean is very open to the public and it’s had a bit of a backlash. The media is known for twisting words so that it changes into speculations and flat out lies. And these are what I believe are also the reasons of why the Standalone hasn’t been released yet. We have heard many possible release ‘dates’ before; typically these are months rather than actual dates. These false reports have put further pressure on Dean and brought disappointment in his fans when not met. Dean may be feeling a bit insecure in how successfully he can meet the hyped expectations now, especially with so many copycats rushing to launch before him and failing miserably. More recently Dean has been much less public with the development process. He’s gone so far as to state he’s afraid to state further details. And this is probably one of the many but major reasons why Dean isn’t happy with his alpha build yet. 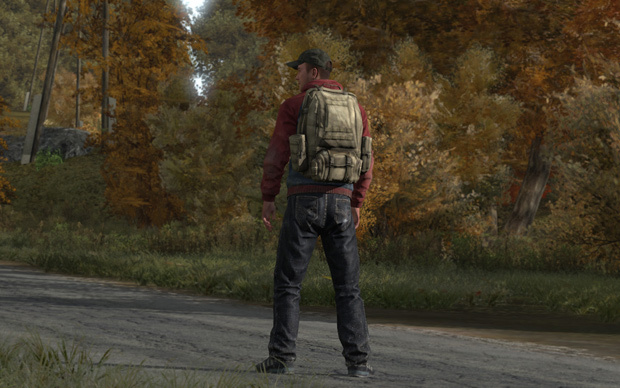 As one of the biggest self-proclaimed fanboys of DayZ, I am hungrily awaiting the standalone but I have to give Dean credit for his work and dedication. The approach of being open to the public has definitely taught him to double check his words, and perhaps changed his whole hindsight of being open to the public. If we have to believe his statement at E3 that the alpha testing of the standalone would launch within two months, then there is only a couple weeks left to go. Even so I would want it as soon as possible; but fear the general public isn’t at a point yet where they would be accepting of testing the alpha state of any game. Still the known changes sound fascinating and I hope I’m chosen to be among the first to see if they stand up to the hype that’s been building for nearly a year now. This entry was posted in Editorial, Featured Articles, MMO MMORPG News on July 30, 2013 by Darren Henderson. This entry was posted in Articles, Editorial, MMO MMORPG News on July 30, 2013 by Jaime Skelton.